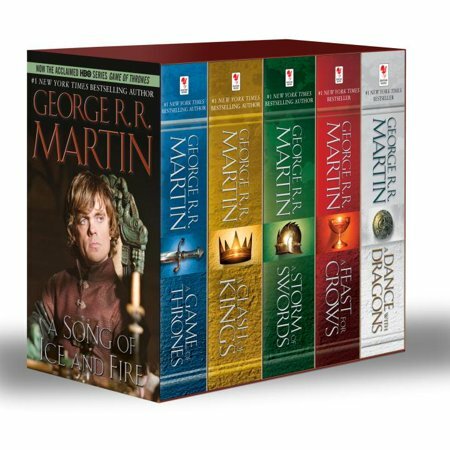 The perfect holiday gift for fans of HBO's Game of Thrones--a boxed set featuring the first five novels! You can't beat the price on this package. If you've been thinking about it, now's the time to buy. This series appeals to more than just fantasy lovers. It lures you in with humanity, political intrigue, massive piles of character development, heartbreak, triumphs, and dragons. I'd been urged to read the books because I'd "Like them if I tried them." After the first episode of the show aired, I borrowed them immediately and plowed through every book that was available. Now that Dance with Dragons is in paperback, I decided to buy this pack to hold me over until the next book. If you consider yourself a casual reader, don't be daunted by these thousand-page monsters. You'll eat them up and be hungry for more before you know it. And since they're in paperback, you can tote them around with you and plunge your nose into them whenever you get the chance. Difficult to do that with the massive hardback editions. Again, I can't stress how great this price is. The individual MSRP for these is $9.99 each. If you have any interest in the TV show or are just looking for something new to read, this is definitely something you want to add to your cart. I started watching the series on HBO this year.....watched the first 3 seasons on demand just prior to the 4th season start. I was so dissappointed when the 4th season was finished because I would have to wait until next season to find out what happens. I did some online checking and found out the story is based on a series of books, so I bought the books...now I don't have to wait to find out what happens....I'll know what to expect when season 5 starts. As usual Walmart had the best price for the entire set of books, so purchased then there. Thanks Walmart for the savings. I am very happy that I purchased these books. I am very happy that I purchased these books - I can read them when I am able to. The story line is very interesting and I look forward to finishing the series. Great set of Books!!!!!! I got this for my husband for Father's Day. We received the books in attractive packaging, in perfect shape. He loved this gift. This is a great deal for for all 5 of these books!